"A Poke in the I, a Collection of Concrete Poems"
Apollinaire would have been charmed by this lovely book, where poetry and illustrations are chasing and confronting each other to finally fuse into a unique lively result. In this book there are not just poetry and intensity but there are as well playfulness, imagination, and lots of fun: the best way to assure kids with a nice approach to poetry. 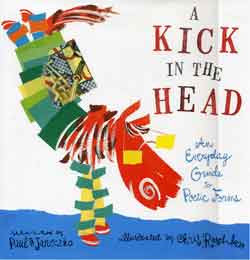 "A Kick in the Head, an Everyday Guide to Poetic Forms"
A real guide to the different poetic forms, with a glossary at the end and technical explanations. A wonderful book, simple though accurate in which, amongst others, we can read poems from William Blake, Edward Lear, Bobbi Katz, John Hollander and William Shakespeare! Raschka's wonderful illustrations are not simply a description of the poems but, thanks to a very clever system, they provide a real visual guide that facilitates the identification of the different poetic forms proposed in the book. 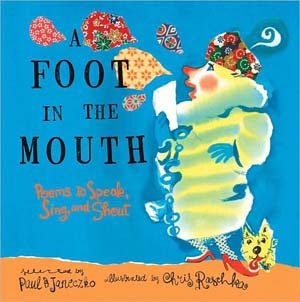 "A Foot in the Mouth, Poems to Speak, Sing, and Shout"
As Janeczko says in his Introducion to the book: "Poetry is sound. Oh, sure, it's other things, too, but sound needs to be near the top of the list. To hear the sound of a poem, really hear it, you need to read it out loud. Or have someone read it to you.". In the index, the author divides poems in various categories depending if they are for One, two or three voices, tongue-twisters, short, bilingual or poems for a group. Among all the poems you will find Jabberwocky by Lewis Carrol, full of nonsensical words but rich in pressing and vibrant sounds. We find Shakespeare once again, an abstract form Macbeth, when the witches are preparing a disgusting magic potion. Hilarious! Raschka's essential images, once again, are not deceiving readers: he plays with the page filling it, getting into poems making the reading not simply pleasant but playful and fun. Another masterpiece for your bookshelves.